Muscoloskeletal disorders and injuries in most cases result in pain, swelling and muscle spasm. Low-frequency electrotherapy has been recognized as an effective modality for treating these conditions either in acute or chronic stage. 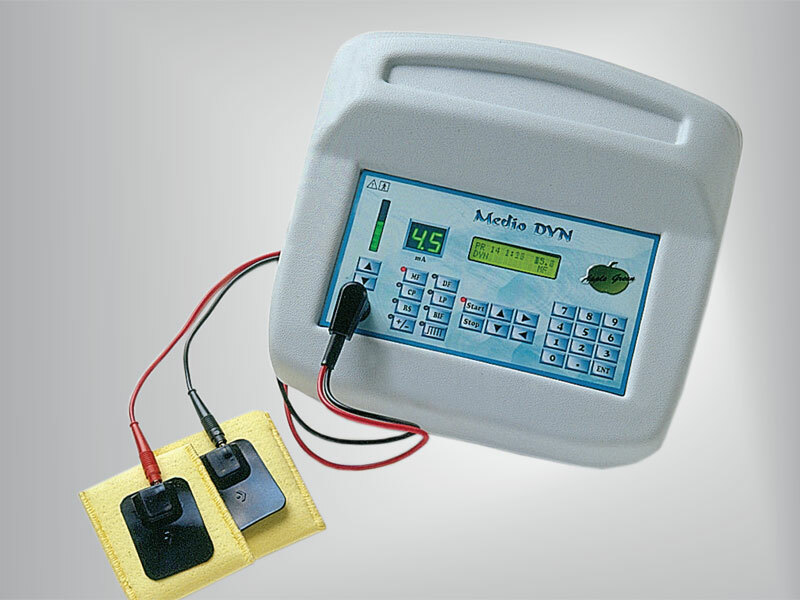 The MEDIO DYN is a computer controlled device offering standard diadynamic currents (MF, DF, CP, LP), 2-pole interference, Russian stimulation, and iontophoresis. Diadynamic currents have been proven to increase the pain threshold and block the transmission of pain impulses to the brain, therefore they are widely used in pain relief therapy. In addition, they reduce edema and accelerate the blood circulation in the treated area what also result in pain relief. The selection of the current form for a certain treatment is easy and user-friendly. Beside the pre-set programs containing only one current form, also the combinations of different current forms are available in certain programs. All the parameters (type and shape of current, duration of the current sequence) in the pre-set programs can be increased/decreased by the user. After the therapy, the initial values of the parameters are set up automatically. The device allows the practitioner to create and store his/her own program that fits to each individual patient. The MEDIO DYN is a professional instrument. The treatment must be performed by trained and experienced personnel in order to assure the successful therapy. Therefore, the device is to be used in hospitals, nursing homes, health centers, private physiotherapy offices or due to its size even in field (sport clubs, home nursing). The MEDIO DYN can be connected to the MEDIO SONO (ultrasound) offering the therapist to take the advantage of using both therapies simultaneously. Its combination with another Iskra Medical device, the MEDIO VAC, simplifies fastening of electrodes to the patient, and improves the treatment results with simultaneous effect of diadynamic currents and vacuum massage.